Want to see more of Australia than the highways and tourist parks? We take a look at what makes an offroad caravan tough. Do you have a yearning to see more of our beautiful country than just highways and caravan parks? Would love to spend days following dirt roads to amazing red and blue gorges or towering waterfalls, then pull up your caravan by a solitary stream and sleep under the stars? 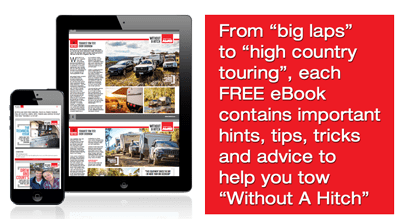 If so, you will need the best off road caravan you can afford – one that can take hours of driving on corrugated outback roads, stay upright when you navigate down steep hillsides or riverbanks and remain impervious to the dust and water you might take it into. Whether you buy your off-roader ready-made or have it fitted out to your specifications, there are a few fundamental requirements. Suspension: The best off-road caravan has the right kind of suspension. To avoid having your caravan fall apart from stress, the suspension needs to be independent or load-sharing. Independent suspension is designed to cancel out the harmonic motion that can occur when driving at speed over corrugated roads. Load-sharing suspension will help to reduce the shock when the wheels hit obstacles on the road. As the front wheel moves over an obstacle, it transfers energy to the wheel behind, which in turn transfers energy back to the front. Coupling: The connection between towing vehicle and caravan will take a lot of punishing off-road, so choose coupling that is specifically designed for the greater angular demands of off-road work. Brakes: Look for electric drum brakes that have been specifically designed for Australian off-road conditions as they will incorporate materials that help reduce vibration and wear, while coping with the higher temperatures caused by heavy braking. Most caravans are similar inside, but your off-road caravan needs to be a little more robust. Look for quality finishes, strong fittings and good storage facilities. Fittings that are glued or stapled might be okay in a regular van, but you will need something a little more resilient in an off-roader. Check the drawers and cupboards – will they fly open when you brake hard or bounce over rocks? Body armour: Plating or ‘body armour’ on the lower part of the caravan will protect it from tree stumps, rocks or anything else that gets in your way. The armour is usually made of aluminium checker plate or powder-coated steel. Stone guard: A stone guard mounted on the front of your caravan will deflect rocks and gravel, but make sure it will absorb the impact rather than bouncing detritus straight back at the towing vehicle. Watertight and dustproof: A watertight door and quality sealants on all joints are important, especially as off-roading in Australia inevitably means that everything will be covered in fine red dust. All other inclusions and features really depend on you and how you want to travel, but it’s a good idea to consider solar-powered electricity, storage for extra water, quality tyres and robust communications. Want more technical detail on what you can do to keep your caravan upright and stable? Take a look at our article on ways to avoid the dangers of caravan instability.